Along with Tower of Power, War was one of the first multi-racial West Coast funk/soul outfits  and certainly one of the best known. In the early '70s, War rode the charts with hits like "Low Rider," "Why Can't We Be Friends" and "Summer"  with groups like the Ohio Players and Earth Wind & Fire, War showed that even in-your-face black artists could attract a viable crossover audience if the music was good. Even after the hits stopped coming, War scored with their presciently named "Platinum Jazz, " full of long instrumental breakouts that did, indeed, go over big with jazz fans and even received airplay on so-called "progressive" rock stations, getting sandwiched between Yes and Emerson Lake & Palmer. Like the above-mentioned Earth Wind & Fire, Tower of Power and Ohio Players, War fell on hard times in the 80s. These guys could all play  could improvise with the best of them, could play jazz, country or rock if need be. But their school of music went out of style for a good long spell. They didn't go away; we did. 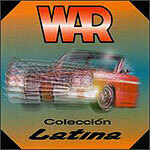 Following up a box-set retrospective and a new recording a few years back, War's latest project is to remix a lot of their older songs into Latino-oriented arrangements  not too much work considering that War's music always had a strong streak of Latin running through it. "Colección Latina" is a gem, reminding the listener not only what a polyglot melting pot California is but just how good War is. The new CD has two new versions of "Low Rider" on it  one with Spanish lyrics and one a contemporary dance mix. There's a remix of "East L.A." with new vocals by Jose Feliciano (so smooth, so hip), and a new mix of "Angel." The rest of the album is filled out with songs that were from the start reflective of the band's Latin influences  "The Cisco Kid," "Ballero," "Cinco de Mayo." There's even a song that wasn't released before, "Salsa." As always with War, the beat is driving, the jams first-rate.